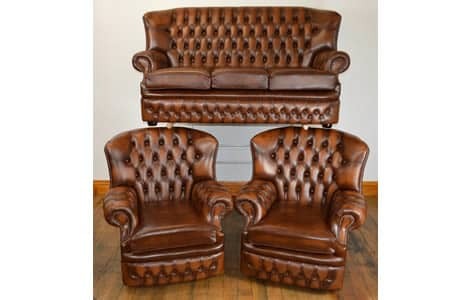 Here we have on sale The Monks Chesterfield Range 3 Piece Suite. Consisting of a 3 Seat Sofa and two Chairs. Finished in Traditional Antique Tan leather. Ready for dispatch at the earliest opportunity. The Monks Range retains the deep buttoned style of a traditional Chesterfield suite as well as offering the added support of a higher back. Made from the finest grade upholstery antique leather on solid hardwood beechwood frames. This range is stylish, comfortable, very hard wearing and an asset to any home.